I can't believe after all of these years, nearly three decades, Bill & Ted 3 is finally a real thing. Keanu Reeves and Alex Winter have been talking up the sequel pretty much the entire time, but at no point did it ever seem to be moving any closer to reality. 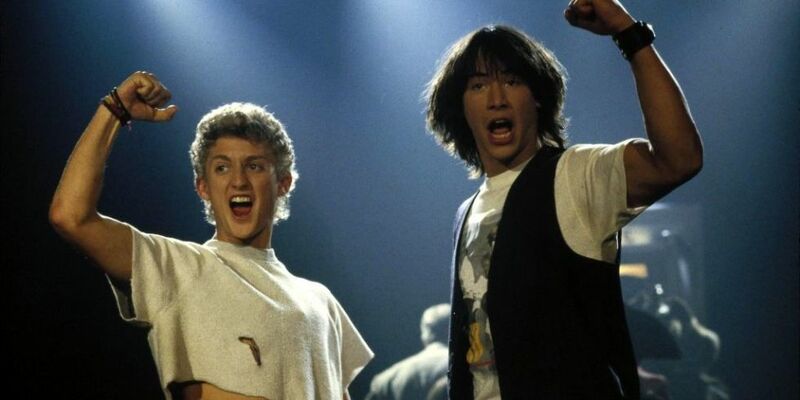 But now the Wyld Stallyns will be reunited in Bill & Ted Face the Music. The plot for the film has been known for a long time, as well. Bill and Ted are now middle-aged and past their prime, but they continue to write songs together. Just nothing good, much less the greatest song ever written as they were prophesied to do. But when the fabric of time and space beings to tear, the duo are warned by a traveler from the future that only their song can save the universe. So they set out on a time travel adventure to find the missing song that will restore harmony, joined by their young daughters and a new group of historical figures. The script will be written by franchise creators Chris Matheson and Ed Solomon, with Dean Parisot (Galaxy Quest) directing. On board to exec-produce? None other than Steven Soderbergh. Damn. And I'm guessing whoever lands the daughter roles will be eyed to continue on with more sequels, assuming this one is a hit. It's expected there will be some kind of tribute to the late George Carlin, who played the time-traveling Rufus in the two earlier movies.